← Leftism: The Taliban of the West? Galactic Imperium News Service (GINS): At the press event hosted last Tuesday afternoon at this year’s Entertainment Expo, a few non-gender specific eyebrows were raised when Snowflake games released teaser posters and in-game footage of their newest project, Social Justice Warrior: The Age of Rage. Snowflake games CEO, Draenal Moonkaxx was on hand at the big reveal, which featured 20 foot tall animatronic “SJW Bots” that periodically shot various stuffed toys representing the 522 known genders out into the crowd. Moonkaxx, who appeared the evening before in a 24 karat gold limo with several Gamergate personalities, claimed that the game is “largely being funded by dump-truck loads of money funneled into the project by socialist college professors, wealthy leftist baby boomers and SJW Antifa feminist types who are looking to cash in on the culture of rage and identity politics”. As the crowd cheered and held up “The Age of Rage” and “Join the Resistance” signs (which were pre-printed signs distributed by Snowflake games before the press event), Moonkaxx picked up a flamethrower and walked over to a male mannequin wearing devil horns and a t-shirt with the words “Gamergate is a Lie” on it, and promptly lit the whole thing on fire. Note: This parody post is intended as a work of humorous fiction / satire. Any relation to actual people or game sites is an unusual coincidence indeed! And while doubtless millions of readers were perhaps hoping that Social Justice Warrior: The Age of Rage actually existed, no such game actually exists (that we know of). 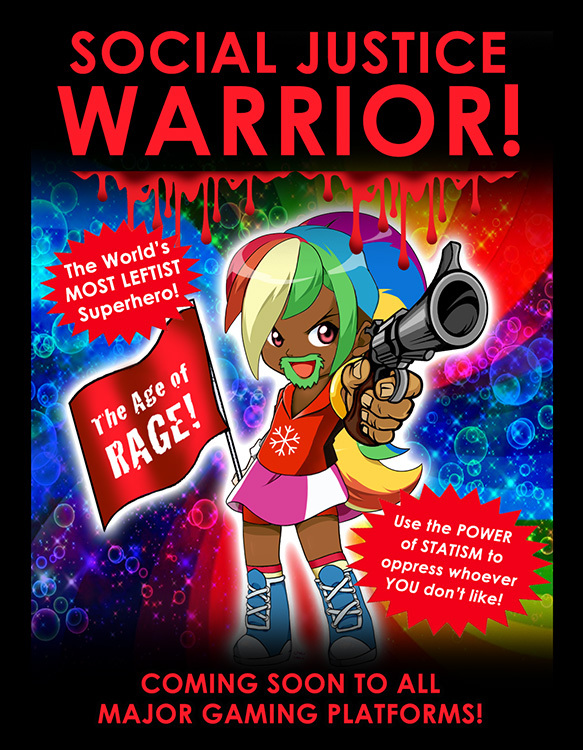 This entry was posted in Uncategorized and tagged anime, antifa, Communist, cronyism, Entertainment Expo, establishment media, feminist, force and aggression, Galactic Imperium News Service, game of the year, gamer, Gamergate, gamergate is a lie, games, gaming platforms, genderless superhero, government power, humorous fiction, identity politics, join the resistance, leftist judges, leftists, parody, powerful lobbyist groups, propaganda, relativistic, reshape society, satire, SJW, snowflake, social justice warrior, socialist college professors, tolerance. Bookmark the permalink.